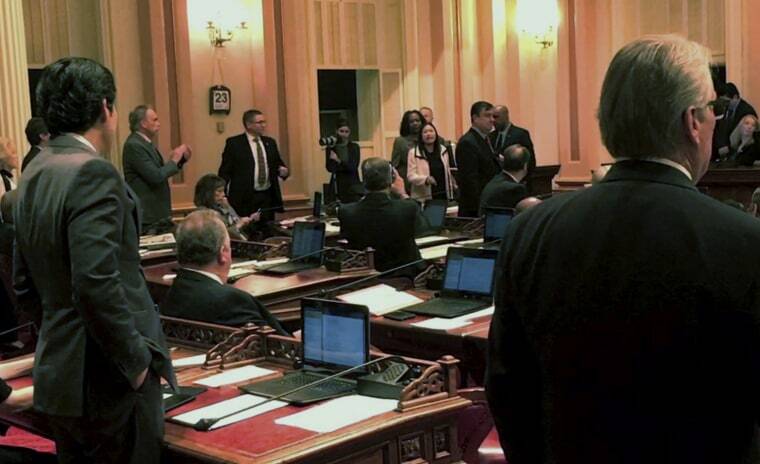 SACRAMENTO, Calif. — A California lawmaker was removed from the state Senate floor after refusing to stop delivering a speech criticizing late state Sen. Tom Hayden for his leadership role in the anti-Vietnam War movement of the 1960s. Republican Sen. Janet Nguyen lived in South Vietnam as a child and fled with her family when its U.S.-backed government fell. She spoke during a portion of the Senate session reserved for memorializing people who have died, and the presiding senator told security to remove her Thursday. "I have every right to speak on behalf of the 500,000" Vietnamese-Americans living in California, Nguyen yelled before leaving the chamber as another senator said her comments were disrespectful and inappropriate. The Senate confrontation drew an angry rebuke from Nguyen's fellow Republicans, who said she was being silenced. "I very seldom get enraged, and I am deeply enraged at this moment," said Minority Leader Jean Fuller of Bakersfield. Democrats said Nguyen violated the Senate's parliamentary rules with her criticism and could have delivered the same comments if she had waited until later in the session and made a motion. "She got exactly what she wanted, which wasn't to speak. She wanted to create a scene for her district," said Dan Reeves, chief of staff to Senate President Pro Tem Kevin de Leon, a Los Angeles Democrat. De Leon said he's "troubled" by the conflict and will conduct an internal review. He said the rules were explained to Nguyen and her staff beforehand. Nguyen, the first Vietnamese-American woman elected to the California Legislature, was born in Saigon and fled with her family on a small wooden boat, according to her legislative biography. After passing through a series of refugee camps, her family arrived in California in 1981. Hayden was a student radical in the 1960s and helped organize protests against the war. He later became a legislator and elder statesman of the country's left. He died in October, and the Senate held a memorial for him Tuesday. "I very seldom get enraged, and I am deeply enraged at this moment." On Thursday, Nguyen began her speech in Vietnamese before switching to English. When Majority Leader Bill Monning said she was speaking out of order, her microphone was shut off. She kept speaking as the presiding Democrat, Sen. Ricardo Lara of Bell Gardens, repeatedly told her to take her seat and eventually ordered her removed. According to a written copy of Nguyen's speech provided by her office, she planned to say that Hayden "sided with a communist government that enslaved and/or killed millions of Vietnamese, including members of my own family." After she was escorted from the Senate, Nguyen's Republican colleagues said she chose not to criticize Hayden while his family was in attendance during the memorial two days earlier, saving her criticism for the next floor session.